Owning a condo or single-family home in Destin includes an outdoor lifestyle that makes coastal living so popular; this resort town on the Florida Emerald Coast boasts sparkling-white beaches, a unique harbor boardwalk, and a breathtaking state park. The city is rich with attractions such as golf courses, country clubs, parasailing, speedboat rides and more...making Destin the ideal place to invest in resort real estate. A combined water and amusement park, classic arcade, a “Gator Beach,” and a fascinating fishing museum are all conveniently located within the city. Destin has other attraction such as movie theaters, family-friendly parks, playgrounds, and modern shopping centers. Specialty shops like picturesque antique stores, quaint gift shops, open-air marketplaces, and charming art galleries are also plentiful. The exceptional beaches are the primary attraction for moving to the area - also named the “world’s luckiest fishing village,” this resort community is home to a variety of deep-sea and back-water fishing charters. The sparkling Gulf Coast waters off of Destin’s beaches are ideal for snorkeling and scuba diving, with vibrant coral, sponges, colorful fish, sea turtles, nurse sharks, and even humpback whales. Whether it is for the fishing, sunbathing, snorkeling, or water sports...there is a variety of outdoor activities for everyone. The city of Destin, Florida has homes for everyone - from the middle of Destin’s bustling attractions, there is plenty of real estate near Destin’s amusement parks and shopping centers to beachfront condos with oceans views of Destin’s sugar-white beaches - golf lovers will find that there are numerous real estate options available for golf course living as well. 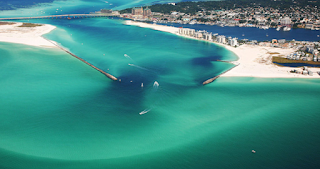 Whether you are interested in a permanent residence or a condominium to use as an investment and/or second home - Destin Florida is the destination for you and your family. Destin is a coastal city located in Okaloosa County, Florida and is the primary municipality in the Fort Walton Beach-Crestview-Destin, Metropolitan Statistical Area. Located on Florida's Emerald Coast, Destin is popular for its white-beaches, emerald green waters and numerous outdoor activities. This resort town originated as a small fishing village, it is now a popular tourist destination with approximately 4 million visitors annually..